The Vivo V15 Pro with model number of Vivo 1818 has appeared on Geekbench. The listing has confirmed that the smartphone will be powered by the Snapdragon 675 chipset. Last week, the Vivo 1818 was approved with Vivo V15 Pro moniker by Thailand’s NBTC body. The smartphone is slated to go official in India on Feb. 20. Recent reports have revealed some of the key specs of the smartphone. The smartphone is rumored to be powered by the Snapdragon 675 mobile platform that was introduced by Qualcomm in October 2018. 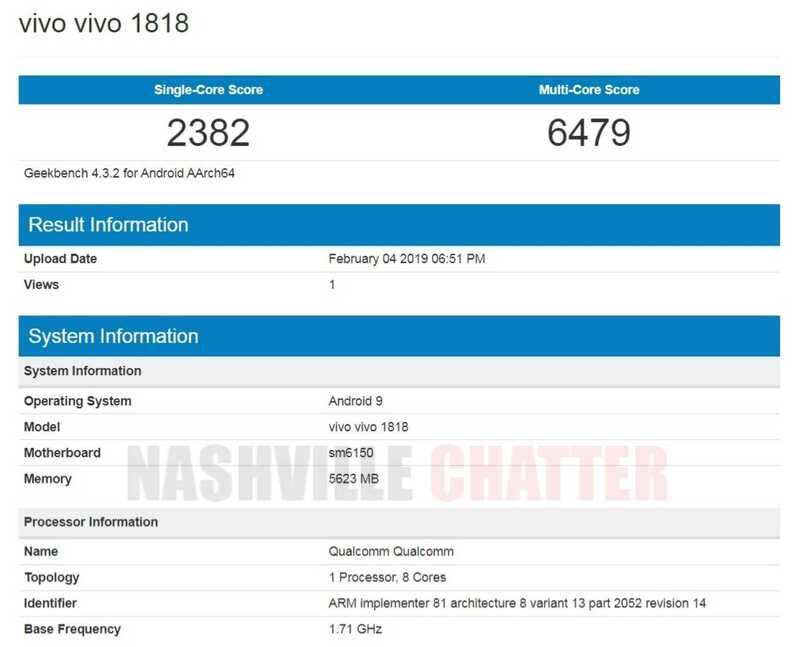 The Geekbench listing of the Vivo 1818 reveals that it is powered by “sm6150” which refers to the “Snapdragon 6150” codename of the Snapdragon 675 chipset. The Geekbench listing further reveals that the Snapdragon 675 SoC is assisted by 6 GB of RAM on the Vivo V15 Pro smartphone. The Android 9 Pie OS is preinstalled on the device. In the single-core test, the Vivo V15 Pro has scored 2382 points and it has recorded 6479 in multi-core test. Recent reports have revealed that the Vivo V15 Pro will come equipped with a 32-megapixel pop-up selfie camera like the Vivo NEX. Hence, the smartphone will be sporting notch-less display, but its exact size is not known yet. The S-AMOLED screen will be embedded with an in-display fingerprint reader. The rear side of the phone will be featuring a vertical triple camera module. It is expected to include 48-megapixel Samsung ISOCELL GM1 as the main sensor along with 8-megapixel and 5-megapixel sensors. The handset will be equipped with an internal storage of 128 GB. The other details of the phone are yet to be revealed. It may be priced closed to Rs. 30,000 in India. The smartphone will be also heading to the European markets since it was also approved by Eurasian Economic Commission (EEC) in the past.